Where do I start with this? 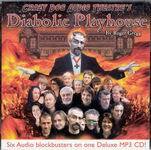 How about here: Crazy Dog’s Diabolic Playhouse is an absolute treasure for fans of audio drama. The scripts are smart, funny, and tightly written. The acting is believable, well-timed, and often hilarious. And it sounds terrific! Each drama included is one hour long, as opposed to the half-hour shows in Crazy Dog’s previous The Apocalypse of Bill Lizard, which allows the Diabolic Playhouse shows a depth that was hinted at in the shorter dramas. Roger Gregg has really stepped onto a different playing field with these productions, and I for one am eager to hear his next project, whatever it might be. A saga of seductive serpents in the salty sea. First up is “Demons of the Deep”, a farcical comedy that had me laughing out loud. The crew of the ocean-going vessel Sea Nymph head out to Rig 39, where not a survivor survived the evil that lurked. In a particularly hilarious scene, three men take the Detritus 3, a tiny sub, down into the deep. I’ll never again be in a cramped space with two other men without thinking of this scene… not that that occurs with any regularity. A fable of magic and firearms in the wicked wild west. Another successful comedy in which an Irishman living in the Old West calls on the services of a magical troll whenever he finds trouble. One day, the troll is stolen, and off the Irishman goes to find it. A fantastical fable of desperate dreams and dark desires. It was while listening to this one that I truly realized how great these dramas really are. 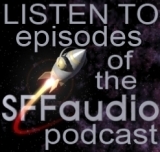 The actors are brilliant (including guest Phil Proctor of Firesign Theatre) and the sound of it all showcases the storytelling power of audio drama. Cyril (as performed by Morgan Jones, who appears in all six of the productions) guides the story as memorable characters board Bus 13B, which breaks down. They end up at this place where the Accountant of the Universe shows up, and… are you getting all this? A dialectically demonic dream of constant repetition. I’m still thinking about this one days later. It’s a moebius strip of a drama where a woman is having difficulty dealing with a totalitarian system. Consumerism, bureaucracy, and color-coded alert systems are all fodder for Gregg and his actors, who completely succeeded pulling me into this place only to make me realize that I already live there. A documentary of poetry, pretension, and possession. This entire piece is done like a radio documentary, NPR-style, complete with interviews of average people about the “Silver Tongued Devil”. The actors who did these segments were perfect! If I had listened to this on the radio without knowing that Crazy Dog had done it, I’d have thought it was news. Who is the “Silver Tongued Devil”? He’s an incredibly famous poet from Cork who has the god-like ability to make people swoon with his words. Again, the piece is multi-layered, achieving both hilarity and poignancy. A story of a virtual man who lost his virtual way. Gerry is thirty-something, single, and works in a comic shop. Much to his girlfriend’s chagrin, he plays a lot of video games, often losing track of time. After accepting the challenge of a master gameplayer, Gerry starts losing much more than time in this powerful drama. 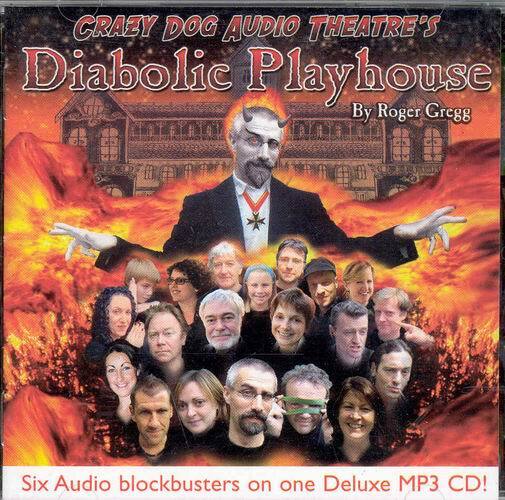 Diabolic Playhouse is a must-have collection from Crazy Dog Audio Theatre, who BBC Radio counted among the “most imaginative producers of radio drama in the English speaking world.” You can find this on Crazy Dog’s website, which is based in Ireland. If you are in the United States, you can pick it up at ZBS.